John Oliver tears apart the Republican health care bill. Since Republicans publicly announced their replacement plan for Obamacare last week, everyone has been buzzing about how the American Health Care Act would stack up against its predecessor. 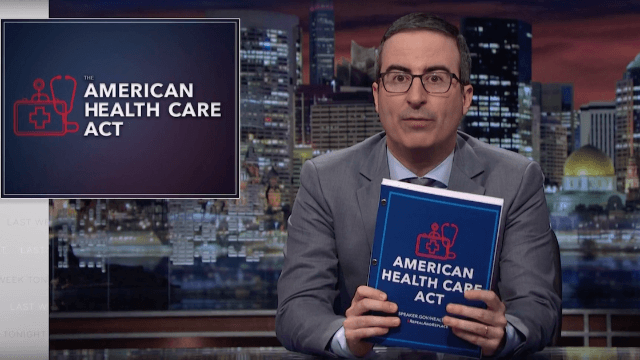 In the segment, John Oliver examines what the bill would mean for older, low-income Americans, and tries to figure out why our president Donald Trump, a man who puts his name on everything from ties to steak, refuses to stake his claim on this health care act. Oliver fears that Trump doesn't really understand (or hasn't even read) the legislation that Paul Ryan and his minions are trying to get passed through Congress, so he debuts a commercial explaining it to him. A commercial which will actually air during our president's favorite news program, Fox and Friends. John Oliver really has that uncanny ability to make us laugh and cry at the same time, doesn't he?